Three of us attempted Tenaya Canyon yesterday (Wickett, Ross and I). We started at Tenaya Lake/Sunrise Trailhead and entered at Pywiack Cascades. Took us 6 hours to reach the bottom of the slabs. We are pretty sure we started the descent too close to Lone Boulder and the Cascades (stupid Beta!). So we ended up setting up three rappels-anchoring on a two different trees and a jutted out rock. Ross (an 18 year awesome climber) free soloed the entire thing and set up the anchors for us. Exposure was huge! Finally after reaching the bottom of the slabs at 2 pm and then making some progress to the Inner Gorge, Wickett realized he usually is at that point at 10 am. This meant we would probably finish at 10 pm and include wet rappels at or just before dark. So we turned back. No, not up the Pywiack Slabs! We headed up Airplane Gully. This was quite a climb and involved a few climbing moves requiring exposure that scared me to death. At some point we ran out of water so that didn't help either. We reached the Airplane Engine and not long after that finally reached mostly level ground. We made it to Olmsted Point at 6:50 and waited 20 minutes for our ride. I have a ton of pictures but won't be able to post until sometime later this week. I will also post a more detailed trip report. But I am mystified about exposure in Airplane Gully. When I have done it, it has all been bushes and talus. Maybe one or two places where you stretch from one huge boulder to another. Did you climb the rock walls, or try to get up the western branch of the gully (where the water comes down), instead of the main gully to the east of it? Well... no I'm really sorry I ended up not joining you. 2am was just too #$#% early to get up for this bird. Did this same thing Aug 27. (down lone, up Airplane... but hiked back to Sunrise TH via domage). All the Beta one would need was in that thread. So mystified how you went wrong way. around Hoffman with Old Dude and sleeping above the "bowl" along Tenaya Creek. Went just to the right of the "Brush Dog" and stayed higher this time and further west. rap 2: You ARE getting wet! You'll have to come back next year and try again. The Inner Gorge is spectacular. Without question the best part of the canyon. so you did run the canyon. Did you do a write up or can you link me to your photos? start from airplane gully or from tenya lake? a lot of this bouldering and xcountry stuff... I thought it was fairly simple. the gorge. So the trek all the way thru the gorge was fantastic. if you stay on that... there is v. little poison oak exposure. soaked by the time I got to first rap and turned back... this time... less water..
was pretty happy that feet were dry to first rap. Was thinking .. sweet..
maybe I should actually read trip reports... har har... 2nd rap is WATERFALL rap. into a pool o wawa. Got soaked completely... and pool was up to dingleballs. like a fish in there. Next time I will put my extra stuff into a dry bag. I'll do this canyon again. The Inner Gorge is worth it. Looks like lots of fun. Agreed that the blue route is the correct one. Stay high for a while after the lone boulder, to avoid some brush, then head more or less straight down the slabs to the big pine tree at the bottom. The close-in route finding is very easy if you are on the overall route, but going down too soon after the lone boulder has been deadly for a least one party. You can easily exceed your rope and anchor supply. I've never gotten my boots wet, though I always remove my boots if I am going to cross the pool at what you call the second rappel. I've never rappelled there...we've either passed the boulder on the left (right in your photo) and scrambled down into the pool, or climbed around the whole thing on the left bank. There's a ramp going up to a ledge (have belayed beginners on the way up there for one rope length), then an easy friction walk back down beyond the ledge. Check it out next time. It keeps your crotch dry. Depending on the year, the pool can be waist deep or deeper. The big pothole on the last rappel is always a fun surprise for first timers, but there is no need to fall into it if you know it's there. However, I always thought that the guy who set the rappel anchor had a sense of humor. He could easily have set it ten feet farther towards northwest bank and avoided the whole pothole problem. For those of you who haven't seen it, this is not your usual highway pothole. Bigger than a hot tub. (cold tub?) It swallows you whole and has water at its bottom. It's a bit hard to make out in your phone "rap 4", but it is the whole darker area under your rope. It has a sharp lower edge, and is invisible when you start the rappel. You have to rappel far to your left (left in the photo), using maximum sideways boot friction, to avoid the pothole and to hit dry ground at the bottom. The pool on the 2nd rap (1st waterfall) was over the dingleballs on the left. I know what you mean on the right... but it's even deeper on that side. and fell foward into the Cold Tub! (I was walking down JUST to the left of the waterfall). In both these I'm talking about looking back up canyon/up stream. On these two pools for this year... there was no way you weren't getting your feet wet. Both were from mid-calf to over waist deep. Talking about it makes me wanna do it again sooner rather than later. No. No. If you are anywhere near the waterfall, you are on the wrong side of the pothole. See photo below. 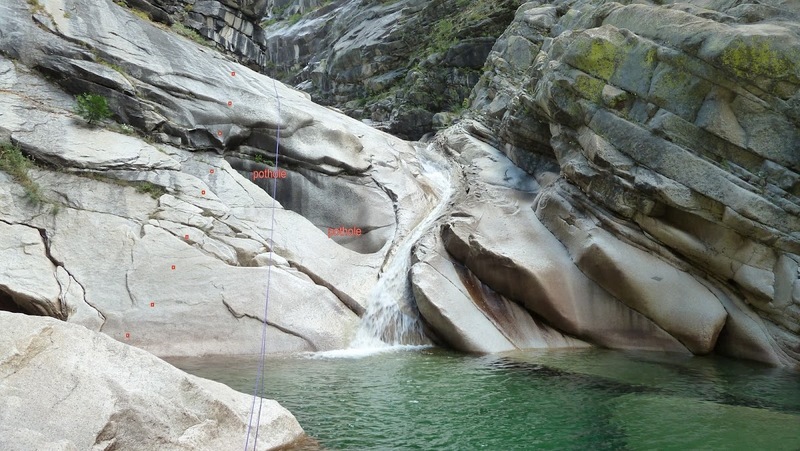 You do have to strain to stay that far to the left on rappel. Or right, if you are one of those guys who rappels facing forwards. If you are good, which I am, you can also keep the rope dry, by feeding the coil out below you as you go down, until you can toss the rest onto the dry bank (behind the boulder in the photo foreground) and rappel straight onto dry ground. I know that you are an elegant fowl. Why would you want to get your feathers wet? Looks like it hasn't changed much in the last 8 years. This was as far up canyon as I got the one time I was up there. I managed to climb up to the edge of the 'pothole' and was going to work my way up the cascade to the right when I stepped on what looked like a good traction point. This was the day I learned beyond a shadow of a doubt that that there is no such thing as traction on wet rock. Don't know if it was covered in something or just plain slick, but I lost it and slid down the slide into the pool. Would have been fun if it had been the intent to slide but . . . Spent the rest of the day drying me and the contents of my bag out before heading back out. Pretty amazing day. Slot canyon! Would I have been able to get much farther up canyon? You would have been easily been able to get up to the slot of the 3rd rap. canyon you are off the creek for about 1/10th of a mile I would say. I put a couple more in my set for you to contemplate. What you did was kewl. A great slot canyon and great views of Quarter and Watkins. I worked my way way over to left to your little red dots after getting past the pothole. when I leaned forward to let more out... sploosh into pothole. Regardless... my fedders were getting wet... or at least me feets. The Circle is the Lone Boulder right? On your picture about halfway between the circle and where your red line meets the green stuff is where we went straight down. If see see the slanted green stuff almost at the bottom (right below a black mark in your picture) is where we ended. Fortunately we had someone with us who was great and basically free soloed the whole thing. Going back and forth to set our anchors and then retrieve the rope. I'll give a few more details later. Crazy busy at work. Airplane Gully is a non trivial up due to all the shrub you have to deal with. Glad you had fun. Looking forward to your pix. I have to finish Tenaya Canyon sometime. Just so I understand doesn't this week's storm shut the season down? The shrub on Airplane Gully really wasn't my problem. I didn't care about a scratch here or there. The freakin' problem was the moves to get up and around rock which required a momentum move and to keep your balance without hand holds or face a 15-20 foot drop onto rock--mostly likely flat on your back or head! The guys I was with seemed to have no problem either but it really scared me. I just did not want to get hurt in Tenaya Canyon. I was much less scared going down Pywiack, the wrong way! Believe me though, I wouldn't trade anything for the experience. To climb up Airplane Gully was just awesome. I haven't even looked at my pictures yet. But I just found the picture of where we started down. I CANT WAIT to show you that one. I also got pictures of two of the three rappel anchors and Wickett rappelling so I want you to see those also. You will probably have a good laugh and you will say "they came down that!". Wickett is there another week so he won't be able to chime in until then. You should hit the reply button so the conversation is indented, etc. Wherever talks about Airplane gully a bit. I went up the water course... which was shrubby to say the least. but it is the main reason there is no overnight parking on Tioga and GP starting Oct. 15th. climber just said "we can just rap down"... Totally understandable. Please post ur pix. With peeps in the pict. it really gives scale to the it. Chick-On I don't mean to flatter you but that is incredible. For you to identify the exact spot with the limited information I gave is really cool. Trying to get pictures done before I literally fall asleep with the computer in my lap. But something you said is interesting. At that point we really felt very uncomfortable and didn't see how bushwhacking up would get us anywhere because it still didn't look any better over to the immediate left. I can't wait for Wickett to weigh in because I can't quite remember how they made the decision. That picture was taken at the spot that is a little blip in the red line above. With respect to the season, be careful late in the game. I remember one trip in October about ten years ago. Just before the dawn light hit us. Walking down the great open granite bowls above the lone boulder, nice friction stuff, and I stepped on an absolutely invisible paper-thin ice coating on the rock. I though that I had broken my jaw for a while. An hour later it would have been gone. If you look at some of my previous comments on the route, you will note the great pine tree that is right below the descent route. It's very visible, and the only big one down there. As Chick-On points out, this picture is too low and too far to the right to be on-route. You should never be headed down straight at the big triangle shrubbery. As you look down we traveled down to the point of the green triangle and then went right. That said it wasn't the original intent to head straight down at the triangle. We were trying to traverse sideways but it was wet in spots which really caused problems. As for the season.... maybe I was not answering correct question. This storm that is rolling thru now... will end up bumping up Yose Falls and all the others. Being honest with my own abilities, I don't think there's no way I could finish something like this. Going down to the Airplane Engine would be adventurous enough. I suppose with enough research and going with someone with superior route finding skills, it might be worth a shot. Glad to hear you made it out safely. It must have been a real thrill. Perhaps giving you an indescribable type of rush? Here is my picture album. The first few pictures are practice rappeling in the Devil's Bathtub. Edited 2 time(s). Last edit at 10/05/2011 03:26PM by chicagocwright. Love the pix, chicagowright. I was especially fascinated by the many changing angles of Half Dome from Tenaya Canyon. Very cool, indeed (although this trek is definitely beyond my abilities (or at least my experience) unless I was with some people who I really trusted to show me the ropes (literally in this case! )).